Woodbury Heights in 2 sentences: Woodbury Heights provides classic high-rise living in the middle of the Courthouse neighborhood. Outfitted with solid amenities, balconies, and extra storage, these condos provide everything you need at a great value. 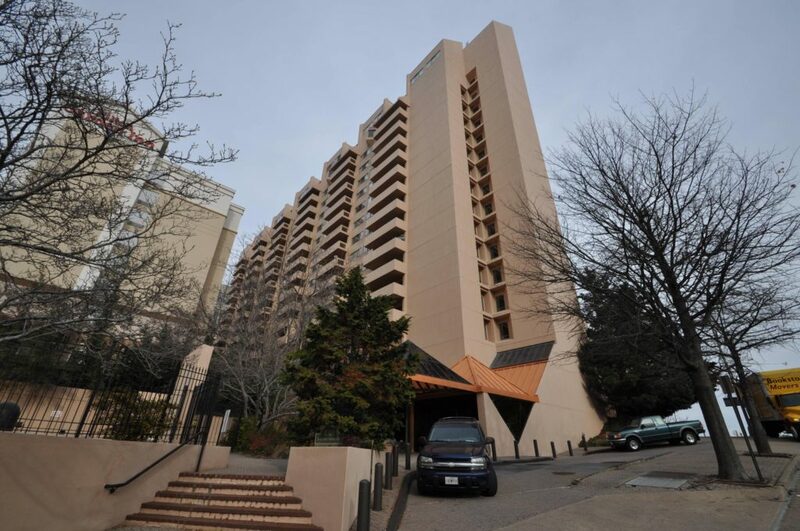 Woodbury Heights is a high-rise condominium in the Courthouse neighborhood that was built in 1983 and contains 170 residences on 18 stories. Situated about a five-minute walk from the Court House Metro, the community offers its residents a great location, a fully amenity package, and suitable one and two-bedroom floor plans. The lobby was recently renovated and is now much more welcoming and bright than the original entranceway. The old lobby was dark, dull, and severely outdated. In addition to a freshly renovated lobby, Woodbury Heights also features an outdoor pool, 24-hour front desk, a fitness center, extra storage, and a sauna. While not publicized, the community is extremely well-run by the board and has never had to incur a special assessment. Even with all the amenities, condo fees are also priced below average, making you wonder what neighboring communities are spending their money on. One-bedroom floor plans start at 597 square feet and top out at 788 square feet. Even though some one bedrooms can be under 600 square feet, this specific tier of one bedrooms has a lot going for it. Tier 16 is an end-unit tier and features a commodious wrap-around balcony that surrounds the entire condo. Located on the eastern side, only units that are on the 15th floor or higher will have any sort of desirable view, but this tier should still be sought-after because of the balcony layout. Units that are on higher floors and can see over The Palatine can command a higher price because of the District and airport view. Once the one bedrooms hit 675 square feet, a half bathroom is included. One bedrooms that include anything more than one bathroom are a pleasant surprise. Even the largest one-bedroom floor plans at 788 square feet will feature the extra half bath. Two bedrooms will start at 864 square feet and work their way up to 1,518 square feet. (There is one 2-level penthouse unit that comes in at 1,626 square feet). A majority of the two bedroom floor plans at Woodbury Heights that you will come across will be around 1,150 square feet. Floor plans will feature distinct living and dining arrangements that will optimize the layout. The belle-of-the-ball at Woodbury Heights are going to be the two-story, two-bedroom, two-and-a-half bath layout that hit 1,518 square feet. Even though these are incredibly rare, four of these five layouts have sold between 2011 – 2016. At Woodbury Heights Arlington, you will notice that many condos for sale will be located on higher floors. It should be noted that because of the terrain, the first four floors are taken up by the garage. Residences start on the fifth floor. While there is a higher chance that you will find a condominium that is on a higher floor, there is a higher chance that your unit will be located at the end of a long hallway. Another slight downside of Woodbury Heights is that some units are located within reach of the Hilton Garden Inn. It’s one thing to be surrounded by other high rises, but the vicinity to the hotel could catch some by surprise. A third downside to Woodbury Heights was the lobby, but that has since been mitigated by the recent renovation. Woodbury Heights condominiums benefit from the solid construction in the community. Not only above and below, but residents also say that noise between units is minimal if anything due to the solid concrete between residences. Woodbury Heights is a well-run, well-established condominium in a great location. With a recent lobby renovation, and plans to revitalize the already popular Courthouse neighborhood happening right outside the community’s front door, Woodbury Heights is in a great position to continue to thrive as one of the most desirable communities in Courthouse.